Turkey’s Alev Gozonar tied together large pixelated polymer portraits of Marilyn Monroe, Che Guevara, Virigina Woolf, Frida Kahlo and other VIPs pairing them with renderings of VOPs – that’s very ordinary people – for her Way exhibit at Mabeyn Gallery in Istanbul last year. 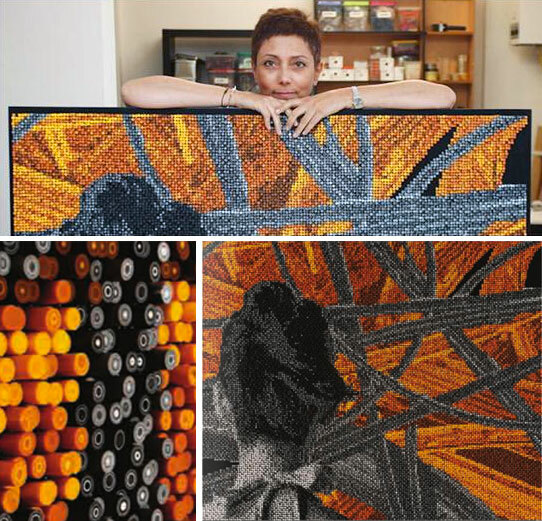 Here you see Alev with her Sahne IV piece that combines thousands of lengths of extruded cane into a striking 49″ x 40″ image. Polymer QR codes designed into the portraits offered viewers another way to interact with the works. Visit the gallery site and read the news coverage to comprehend the scale and impact of these unusual mosaics. There’s a weekend worth of research here that may make you rethink scale and size. Wow! I love how the canes are of different length, art with texture really speaks to me. These works completely amaze me. Polymer as a medium for fine art – YES! It’s wonderful to see Polymer Clay taken to a High Art form. Alev’s work is amazing and inspirational. Yes, Cynthia…I’ve been thinking about working in a larger scale. This is just amazing! I am completely wowed right now! Wow! I’m so happy fine artists are using polymer clay as a medium!! That’s where it belongs: in every level of creative works. This is one of the highest!! Magnificent work by Alev!! I’ll keep checking and enjoying her marvelous work! Mind blowing!! What an outstanding artist – thank you for sharing her work Cynthia. That is absolutely amazing and mindblowing! Such a talented woman! Alev , is just the best in this art. I loke very much her talents, and furthermore, it is a great WOMAN! I started working with polymer clay very recently and iam totally in love with it…This portrait is just wooow…..She is such a talented artist.. This is proof that just when you think you have saw everything there is to see in polymer clay – someone comes up with something like this and reminds you that there are truly endless possibilities in this fun medium we love so much!